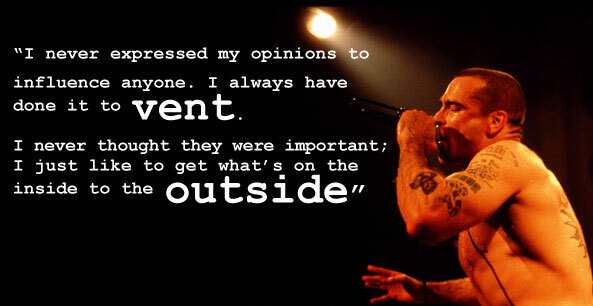 Henry Rollins has made a name for himself in all avenues that he has put forth his effort towards. He's an accomplished musician, public speaker, actor, televesion host, etc. Scene Point Blank recently had the opportunitiy to correspsond with Mr. Rollins, and to delve into his psyche. Though I've been doing this for years now, the most difficult interviews I have to conduct are always with the people I admire. On one hand this is what I'd like to do with my life, so there is a need to make myself seem both professional and astute, but on the other I still feel the want to gush about how much they have done for me as a person, and how greatly I appreciate their work. I'll try to keep that aspect minimal, so first thanks very much for your time in replying to this email, Henry, and second on behalf of myself and everyone else at the site, thank you for remaining one of the most definitively outspoken and upfront individuals in media today. Scene Point Blank: You've been a prominent figure among certain scenes for years, and well it's undeniable that there has never been a time you've been shy in voicing you opinions. When did you first realize that your thoughts had any baring/influence? Henry Rollins: I never expressed my opinions to influence anyone. I always have done it to vent. I never thought they were important; I just like to get what's on the inside to the outside. I perhaps provide some perspective but I don't think I have any real influence. Anyone is free to take anything I say with a grain of salt. The same goes for Rush Limbaugh. Scene Point Blank: Despite your success in numerous public avenues you've remained constantly opposed to the term celebrity in self-reference. Given that you hold some obvious notoriety, how do you view your line of work? What would you use to describe it? Henry Rollins: It is mainly an obsession I think. I work all the time on all these projects. I don't know if they are any good, all I know is that I work on them all the time and it's pretty much all I do. If you are out there in the public eye, someone will attach the celeb albatross around your neck and it's a foolish thing to give that any attention. The work is important, not the amount of people who want your autograph. I get recognized everywhere I go. I am writing this answer in Damascus, Syria, I have been recognized here of all places. I answer the questions, shake the hands and do the photos, answer the letters as best I can and try to be cool to the people I meet. Past that, I am just a worker ant. Scene Point Blank: Over the course of your career you've done hundreds upon hundreds of interviews, but more recently with your television show, you've had the opportunity to be on the other side. Has that experience changed the way you view interviews as a whole? In addition to that what do you think makes for the best interviews? Henry Rollins: It has made me answer questions more succinctly, as that's the best thing for me as an interviewer, someone who knows what they're talking about. That being said, you have to know how to pitch that question so the person can lay into it and really deliver. This is a matter of knowing who you're talking to and taking time to really think about what you would like to get out of the subject. Scene Point Blank: While the intention right now is heading out on your spoken word tour, and continuing with your show on IFC, there is a lot of interest regarding your next steps both as a musician and an actor. Have you any plans for the upcoming future? Henry Rollins: I don't know what lies ahead for me in the world of music. I have some ideas but it will take awhile to get clear of other work to address them. I don't think I will be doing music to the extent I have in the past. I feel very much been there / done that with music in a way. As far as films, that's a day job to me. If I am not doing anything else and I can get that work, I will go after it and try to get that employment. I work for a living. Scene Point Blank: Speaking of your acting during your performances you've been an anarchist cartoon on Batman, beaten up Drew Carey's best friend, and appeared as yourself in a video gaming revolving around fighting rappers. Do you actively seek out these roles, or do they mostly come to you? Henry Rollins: Both. I am always looking for work. I go after things and sometimes they come to me. I'd rather be working all the time than only part of the time. Perhaps I have no real clue to what real life is so I am doing all this stuff instead. That's what I have been told. Scene Point Blank: I find that one of the biggest reasons that political activism dies out in people is their failure to know what to do past the stages of awareness. As a man who is a strongly advocates both action and knowledge in regard to the world around us, what would be your suggestion to combat this loss of interest? How would you suggest people move into action? Henry Rollins: I think for one to take activism to heart, you really have to see your place in it. You can't do it as a gesture. It has to have real meaning for you. Americans should see that if they don't take a hold of America, they are going to lose all the parts that are so great about it. It's now down to that I think. We have taken this country back from the corporations, who use Americans as human ATM machines. I think the best thing is to be aware and start small and local. Something in your town, neighborhood probably can be in a better state. Get in there and change it. The only change it will make on its own will be to degrade. Voting is also a good thing. Scene Point Blank: Since the beginning of this year I've asked everyone I've had the opportunity to interview these questions in attempt for me to help give definition to their mediums and mindsets. Why do you create art/music/writing, and what does that do for you? Henry Rollins: I do it to get what's inside me outside me. For me, it's the scratch that temporarily relieves the itch. Then the itch starts again and it's back to work. Past that, I don't know. It's not exactly fun all the time. A lot of this work is very painful and hard on the psyche. Posted July 14, 2008, 10:05 a.m.